Weld-A-Rail have a proactive, well-developed method for identifying the customers’ needs and expectations. Customer Perception Surveys have been developed that provision for both measurement of customer satisfaction and responses to be analysed. Resulting trends are used for developing action plans aimed at continual improvement of customer service / relationships. The company have a documented procedure for addressing customer complaints. These are handled by knowledgeable professionals with provision having been made for managers to review issues with customers when appropriate. Detail records are kept, analysed and used for developing action plans. 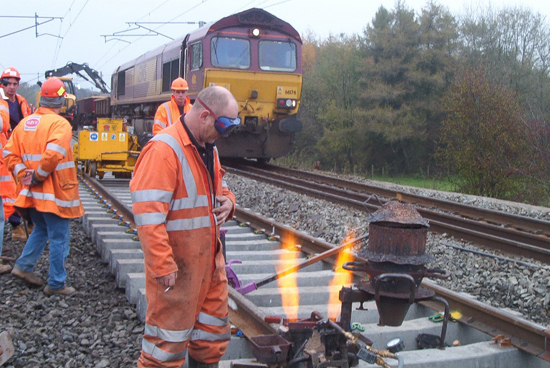 Weld-A-Rail Ltd currently operate within the controls of a fully documented Quality Management System compliant with BS EN ISO 9001: 2000, Link-up Protocol PP0001, the audit protocol by which Network Rail measures suppliers working on their managed infrastructure against commitments contained in their Quality, Safety and Environmental Management Systems and Link-up Product Protocols 570702 Track Welding Contractors – Alumino Thermic Process & 570705 Track Welding Contractors - Arc Welding..
Weld-A-Rail have prepared and are in the process of implementing a Contractor Assurance Case compliant with Network Rail Company Standard RT/LS/P/016. Weld-A-Rail have a published Health & Safety policy statement. Copy attached. The company has documented procedures that provision for the assessment of the risks to the health & safety of it’s employees and anyone else who may be affected by their work activity. The organisation puts into practice the necessary health & safety measures following risk assessment and maintains records accordingly. Weld-A-Rail have appointed First Quality Solutions Ltd as health & safety advisors (MIOSH qualified) to assist in applying the measures needed to comply with the duties under health and safety law and the requirements of the Rail Industry. In addition the company has documented emergency procedures and have provided all employees with appropriate Health & Safety training.